Health insurance provider, Kaiser Permanente purchased about 20,000 "Healthy Holly" books from Mayor Catherine Pugh's Health Holly LLC. They made multiple orders of the book between 2015 and 2018. BALTIMORE, Md. — Health insurance provider, Kaiser Permanente purchased about 20,000 "Healthy Holly" books from Mayor Catherine Pugh's Health Holly LLC. They made multiple orders of the book between 2015 and 2018. Since 2013, Kaiser Permanente has purchased and distributed thousands of books for children, families and adults free of charge as part of our commitment to improving the health of the communities we serve. We have distributed books about leadership, healthy habits and other wellness topics at no cost because we know that reading has long-term positive effects on health, including better sleep, lower stress levels, higher self-esteem and decreased rates of depression among readers vs. non-readers. We have delivered books to back-to-school fairs, elementary schools, communities of faith and early childhood education and care centers, for example. Since 2015, Kaiser Permanente has purchased and distributed Healthy Holly, among other books, to families and children throughout Maryland, Virginia and the District of Columbia. We have purchased and distributed about 20,000 Healthy Holly books, at a cost of approximately $114,000. Kaiser Permanente provides health insurance to Baltimore City employees. CareFirst made contributions to a charitable organization that used the money to purchase "Healthy Holly" books. In October 2011, CareFirst contributed $7,000 to the Associated Black Charities of Maryland. That group confirmed that money was used to support the purchase and distribution of "Healthy Holly" books. In February 2014, CareFirst contributed $7,500 to ABC for the purchase and distribution of the "Healthy Holly" books. CareFirst said in a statement that in February 2017 it declined to contribute $7,000 to ABC for the books. Associated Black Charities confirmed it received the 2011 and 2014 contributions from CareFirst , and that those funds were used to purchase and distribute Healthy Holly books, the CareFirst statement said. 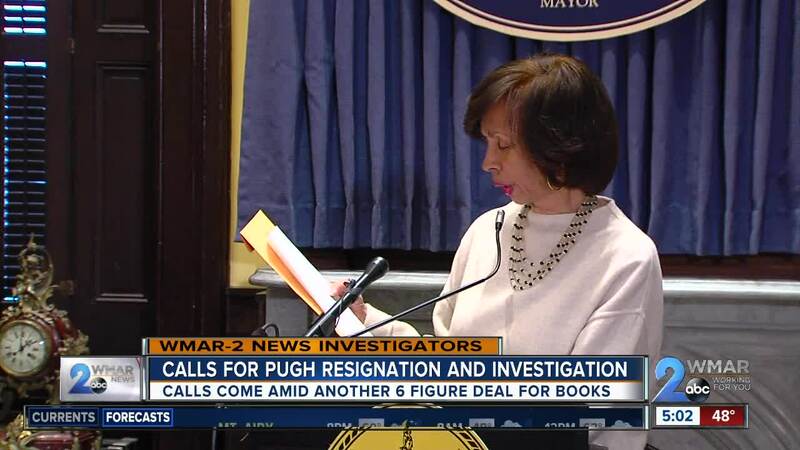 On Thursday, Mayor Pugh shared details of her arrangement with University of Maryland Medical System regarding the controversy of her children's books, "Healthy Holly." She did not mention selling the books any other organizations. Comptroller Peter Franchot is calling on the Mayor to step down. On Twitter he said, "The Mayor has to resign - now. The people of Baltimore are facing too many serious challenges, as it is, to also to deal with such brazen, cartoonish corruption from their chief executive." Councilman Zeke Cohen is also calling for the Mayor to resign saying, "Mayor Pugh has lost the moral mandate to govern and the public's trust. Baltimore deserves better."